KANSAS CITY, Mo. 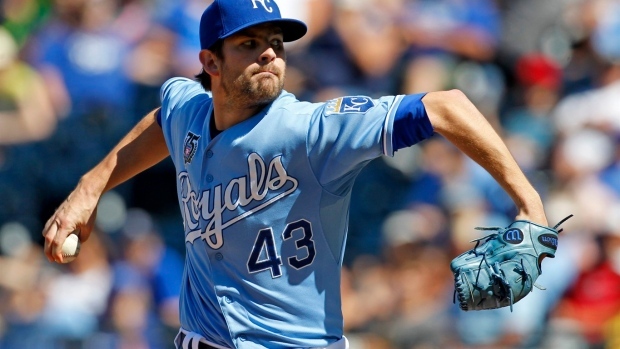 - Former first-round draft pick Aaron Crow was traded from the Kansas City Royals to the Miami Marlins for left-hander Brian Flynn and right-hander Reid Redman. Crow, a 28-year-old right-hander taken with the 12th overall pick in 2009, was 6-1 with a 4.12 ERA and three saves in 67 relief appearances this year. The Topeka, Kansas, native did not pitch in the post-season. "We're not sure how the rest of the off-season will unfold in terms of what else we add to our pitching staff," president of baseball operations Mike Hill said. "But we love the flexibility. We love the thought he could possibly be a starting option for us. At a minimum we know he'll be a valuable bullpen piece and add to the overall depth of our staff." "It's a little more taxing on your body, and I think a little more challenging, too," Crow said. "As a reliever you only face guys one time. Facing them three times in one game is a little bit different. It's a little more challenging. It's something I'd like to see if I could be successful at." Flynn, 24, was 8-10 with a 4.06 ERA in 25 starts at Triple-A New Orleans and also had one start and one relief appearance for the Marlins, a year after making four starts for Miami in his first big league season. He played at Wichita State in 2009 and '11. The 37-year-old right-hander was acquired from Texas in July and went 3-0 with a 1.53 ERA in 23 games for Kansas City and 4-1 with a 2.66 ERA in 61 games overall. He was a veteran presence in a young clubhouse as the Royals made the post-season for the first time since 1985 and lost to San Francisco in a seven-game World Series.